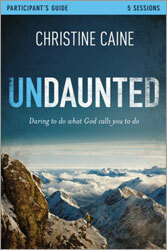 Subtitle: Daring to do What God Calls You to do. Using her own dramatic story, Christine Caine shows how God rescued her from a life where she was unnamed, unwanted, and unqualified and called her into a God-filled and faith-fueled life. This compelling five-session video-based Bible study offers life-transforming insights about how not only to overcome the challenges and often painful circumstances we all experience, but to actually grow from those experiences and be equipped and empowered to help others. So what are you waiting for? Be the LOVE. Be the HOPE. Be the CHANGE that his world needs. Designed for use with the Undaunted DVD. Small group leader helps included.